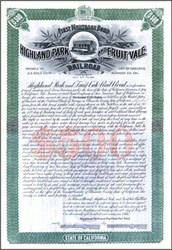 Beautifully engraved Bond certificate from the Highland Park and Fruit Vale Railroad issued in 1891. The bond was issued for $500 and was payable in Gold Coin. This historic document has an ornate border around it with a vignette of an unusual double decker car witn an underprint of $500. This item is hand signed by the Company�s President ( E. C. Sessions ) and Secretary ( F. J. Woodward ) and is over 123 years old. The company operated a line of 10.5 miles, owned 8 double decker motor cars and 2 service cars. E. C. Sessions of Oakland, California, was a real estate tycoon who organized the Oakland Fruit Vale Railway Company to service his newly subdivided Highland Park and Diamond districts. He invented a height saving design of double deck car, placing the upper longitudinal seats directly on the clerestory of the first deck roof with a hangover built out over the letter board for the walkway to the seats. This walkway terminated in spiral staircases to an open center platform. Mr. C. L. Pullman, brother of George Pullman, (inventor of the sleeping car), formed a partnership with Sessions. Street Railway Publishing Co., World Building, Park Row. Oakland, Cal.�A franchise has been granted to the Oakland Consolidated Street Railway Co. to build an electric road, work to be begun within six months from date. THE street railroad for which E. C. Sessions has obtained franchises to build on Fruit Vale Avenue and from Fruit Vale Avenue to Thirteenth Avenue and East Eleventh Street, is to be operated by a corporation. The name of the company is the Highland Park & Fruit Vale Railroad Co. of which articles of incorporation have been filed. The capital stock is $500,000, of which $6,500 has been subscribed. The estimated length of the road is five and three-quarters miles. Highland Park & Fruit Vale Railroad Company. The lines embraced in this system are owned and operated by E. C. Sessions, with J. E. Morris as superintendent. Mr. 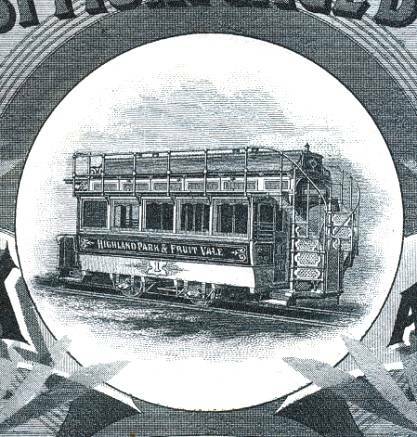 Sessions is already well known in street railway circles as the inventor of the double deck cars which bear his name, and are manufactured by the Pullman Company. A number of cars of this type, remodeled, however, are being operated on one division of this company. The lines are operated in two divisions; the one which extends through the business streets of East Oakland is equipped with combination cars, open both ends, but the Park division, which runs north from its junction with the steam line on Fruit Vale Avenue, is equipped with double deck cars of the latest design, and which are being operated to the entire satisfaction of a traveling public and the management. As will be noted from the accompanying illustrations, these cars differ materially from the ordinary type of double deck cars. The body is provided with an open compartment in front, with short seats facing out, and the roof extends over this in the form of a long hood. The steps for reaching the second deck lead up from the rear platform, and the deck seats are placed back to back, with a light pipe railing along the edge of the roof. The canopy is low, and only sufficiently wide to cover the passengers when seated, leaving an unobstructed aisle along each side, by means of which the passengers can reach or leave their seats. A glass front is provided between the deck and roof, and a glass partition extends the full length of the car between the seat back and the canopy. This is designed to protect the passengers from the air currents, and makes the ride upon the roof fully as agreeable in this respect as on the inside of the car. The interior of the car is handsomely finished and has two bright metal posts on each side to support the roof, which has a double heading on each side to conform to the outside arrangement of the roof. The cars are twenty-four feet over all, and have a seating capacity of fifty-two people. These are equipped with electric signal bells, there being ten push buttons on the upper deck, which are placed in the partition frame, and similar buttons on the inside of the posts of the closed portion. The signal bell is operated by a current generated in a dry battery placed under the seats. The cars are also equipped with ten incandescent lights and an electric headlight. The bodies are mounted on Taylor trucks and are driven by means of two fifteen horse power ThomsonHouston motors. The brake mechanism is operated by a jointed lever, which was invented by Mr. McGregor and which is manufactured by Meritt & McGrew, of Oakland. This lever is so constructed that by a slight forward movement all the slack of the brake rods is taken up, and then a short back pull sets shoes home. It is a very ingenious device and is operated in a very satisfactory manner, not only on the cars of this line but on others in Oakland. It will doubtless come into extensive use. The power station is a one story, corrugated iron structure, with a car house of the same material adjoining. The power equipment consists of two Ball engines and one 300 H. p. Hamilton-Corliss engine, all of which are run condensing. The cooling apparatus consists of a series of shallow wooden vats arranged in four tiers in the form of a square which is located across the street, to which the water of condensation is delivered through a large pipe from the pumps and is employed over and over as fast as it cools. The large engine is belted direct to two multipolar generators, class 90, and the entire generator equipment consists of three machines of the same is both wood and coal, the different materials being used alternately according to the supply in the market. Eucalyptus wood is chiefly employed. The steam and power equipment was installed by the Risdon Iron Works, of San Francisco. The company also operates a homemade sprinkling car, which is employed for sprinkling the streets on which the lines are located. The transfer table in the car house is operated by a lever having double pawls and ratchet attached to the axle, by means of which the same lever will move the car in either direction. The lines of the company will be extended during the coming season, the piincipal portion of which will be two miles on nth Street, for which a bridge is being built across an estuary of the bay which sets in across the route. The fare on all the lines is five cents, and twenty-one celluloid tickets are sold for a dollar. Transfers are exchanged over the East Oakland line. Conductors and motormen are paid twentytwo cents an hour, and some of them work fourteen hours a day. They are paid once a month. The lines are operated in a highly satisfactory manner, and the route over which the double deck cars run is a very popular one on Sundays and holidays, and in pleasant weather the ride on the upper deck of one of these cars along the shady avenues of the city is very enjoyable indeed. Oakland, San Leandro & Haywards Railway. This is chiefly a suburban line running from Oakland through the towns of Fruit Vale, Melrose, Fitchburg, Elmhurst, San Leandro to Haywards, with a branch line of a mile running to San Lorenzo. The system embraces twenty miles of track, and the route from Oakland to Haywards is thirteen miles in extent. The greater portion of the line is single track with turnouts. The line is exceedingly well built and equipped, and is operated under the efficient management of F. M. Leland. The route is through a most charming country, and is bordered on eacli side with orchards and vineyards, interspersed with grain fields and with numerous mansions and cottages, the homes of many business men who do business in San Francisco. Surrounding these homes are lawns and flower gardens which are rivaled only by those in Oakland proper, so that a ride over the route, which is parallel with the mountain range, near by on the left, on the outward trip, is one of the most enjoyable to be found on any suburban line that we have ever visited. The rolling stock, which was manufactured by the Carter Brothers, of San Francisco, consists of twenty-five cars, twenty of which are twenty-two feet six inches over all. These are equipped with one twenty-five horse power motor, and are mounted on eight Brill and twelve Tripp four wheeled trucks, the latter having roller bearings. There are also five double truck combination cars mounted on Brill pivotal trucks with thirty-three inch wheels, and which are equipped with two twenty-five horse power, VV. P. motors, and these on some sections of the line are run at a speed of from twenty-five to thirty miles an hour, some of the cars making 202 miles a day, the entire trip of thirteen miles being easily made, including stops, in fifty minutes. Glass fronts are provided on all the cars to protect the motormen when running at high speed. These consist of three heavy panes of glass with suitable framework. The seats of the closed compartment are of rattan with tilting backs and were manufactured by Hale & Kilburn. The four wheeled trucks have a seven foot wheel base, and to facilitate rounding the curves, a three track construction is employed at some of the corners. The large wheels for the double tracks weigh 425 lbs. and the smaller wheels 330 lbs. each, and cost four and a half cents per pound when shipped overland, but only about three and a half cents by water. The wheels have a tread of about three inches and a seveneighths inch flange. To prevent tilting, the superintendent has added an additional leaf to the elliptical springs on the Brill trucks, which materially improves the riding of the cars. An axle three and five-eighths inches in diameter is now employed in place of the original equipment which was only three and seven eighths, the bearings of the motor being bored out to accommodate the larger axle. A special collar is also employed, which is attached to the axle without a groove, thus reducing the chances for broken axles. Two of the large cars are equipped with Genett air brakes which are operating in a highly satisfactory manner. A chime whistle, operated by air from the brake receiver, is provided as a signal in addition to a rotary bell of the New Departure type. The air whistle is an agreeable change from bells, and can be heard for a long distance. The ease with which motormen are able to control heavy cars by means of the air brake is in striking contrast to the frantic efforts usually required with most types of lever brakes. The power station is located atElmhurst, seven miles from Oakland, and is a plain structure of corrugated iron. Similar buildings near by are employed for car barns and repair shops. The power equipment consists of three batteries of Heine boilers of 120 H. P. each with separate settings and an iron smokestack for each. The fuel employed is imported coal costing $8 a ton delivered, and it requires about five tons a day, or a cost of $40 to operate the line The engines are three in number, and are all of the compound, condensing type, two of them being 150 H. P. each, manufactured by Mcintosh & Seymour, and one of 500 H. P., manufactured by the Ball Engine Company. The smaller engines are belted direct to an eighty horse power, M. P. generator, and the large engine drives by direct belting a 300 H. p.,M. P. generator of the same make. The Conover air pumps are located beneath the floor, and are operated from the engine shafts, and a vacuum of twenty-three and a half inches is obtained. There is also a large fire pump and feed water pump. The Risdon Iron Works, of San Francisco were the contractors for the steam plant which was designed by the superintendent, and furnished the Ball engine, while the other two engines were furnished by Rix & Birrell, of San Francisco, agents for the Mcintosh & Seymour engines. The engine room is kept in a scrupulously clean condition, and the engineer has brightened up the room by painting the stationary parts, including the railing, pedestals and walls of the pits, in fancy colors. A system of cooling pans for cooling the water of condensation is located in the rear of the station, and consists of a shallow wooden trough 900 ft. in length, which is arranged in four tiers on each side of a square. Water being pumped from the hot well and delivered to the upper tier, flows through the pans and drips into a large sunken storage tank directly beneath the cooling pans from whence it is pumped and used over and over again. The two car barns are of sufficient capacity to store thirty cars, and have the tracks elevated so that the pits extend entirely across the house, giving ready access from one to another. As a precaution against fire, stand pipes and hose are provided in and about the buildings, and a pressure of 150 lbs. is constantly maintained. The lines of hose are doubled and wound on suitable reels, so that by taking hold of the nozzle the entire coil is readily unwound, and as soon as the hydrant is opened and the pressure relieved, the steam pumps start up automatically. The repair shop is equipped with a fair complement of iron working tools, and is operated from a small engine with overhead shafting. Two wall cranes with long arms are provided for handling the motors. There is also a truck about three feet high, with castor wheels, upon which the armatures can be moved about the shop. The blacksmith shop is provided with a power blower, and there is every convenience for making repairs. It is a rule with the superintendent to have each car brought into the repair shop once in three months and thoroughly overhauled, whether it is reported in bad condition or .not. By this practice the rolling stock is kept in fine condition and always ready for service. In addition to the rolling stock noted above, two Brill sprinkling cars are employed, with which the streets on the city end of the line are sprinkled, city water being employed, for which the company pays twenty-five cents per 1,000 gals. The track construction was done in a most substantial manner, a forty pound T rail being employed for most of the distance. This is spiked directly to ties which are laid sixteen to the rail, the joints being suspended, and connected by extra heavy, nineteen inch fishplates of special design. The ties rest on a bed of gravel from four to six inches in depth, the original excavation being thirteen inches from the top of the rail, and although the line has been in operation since May 8, 1892, the joints are standing up exceedingly well, so that when riding over the line in eight wheel cars the joints are hardly perceptible. The receiving station for the entire system adjoins the superintendent's office at the power station, in which lady clerks are employed. At the windows of the receiving station two small boxes are provided which operate in a case, and which, being pushed out from the inside, are left in position with the lids open. After making his deposit in the box the conductor closes the lid, and it cannot be opened until it has been withdrawn from the inside, and the contents removed. It is then returned into position to receive the second deposit. A folding blackboard is provided in the lobby on which the names of the conductors on duty are written with white chalk, while those on leave are written with yellow chalk. Adjoining the receiver's window are also two circular cards upon which the names of the extra conductors and motormen are written. These cards are provided with pointers, like the hands of a clock, which are turned to the attendant to indicate the name of the extra who is first to come on duty. This saves the attendant the trouble of answering inquiries in regard to extra runs. Each conductor is provided with a small leather gripsack in which he carries his punch, transfer tickets, train tickets and trip slip. These are opened and filled every night by the receiver, so that in starting out in the morning the conductor is sure of having all the necessary tools and appliances. The motormen are also provided with a wooden box which is about 9X9X16 ins. This is provided with a Yale lock, and contains his kit and tools, consisting of an oil can, extra carbon brushes, piece of wire, monkey wrench, screw driver, pair of pliers, chisel, hammer, a piece of cord, sand paper, extra fuses and other necessary tools. On coming off duty the motorman deposits his box in a case in the lobby, which is divided into sections properly numbered. The motorman's tool chests and kit of tools cost about $10 each. In engaging motormen, only those having had experience on other lines are employed, and who are given a thorough examination before they are engaged. The superintendent examines and engages all employes. Applicants are required to make a deposit of $25. As a general thing, only one out of every three applicants for the position as conductor is found competent for the position. Conductors and motormen are paid twenty-one cents an hour, and work from seven to twelve hours,'and they are paid every day between twelve and one o'clock for the work done the previous day. A large time table is posted, from which the employes can take their time, and in addition each motorman and conductor is provided with a time card on which the time for his particular runs is printed. The fare over each division of the line is five cents. From Oakland to Hay wards it is thirty cents, or fifty cents for a round trip, tickets being good until used. When a passenger pays a fare over one division, the conductor hands him a hat check which indicates his destination, different colored checks being provided. For this purpose the conductor carries quite a number of checks of different colors, which are printed on sheets, which he tears off and hands to the passenger. No passes are issued, and in case the superintendent or other officials wish to pass any person, he is provided with celluloid checks which he hands to the conductor, the conductor being instructed to receive a ticket or check, or collect fare from every passenger. At the terminal of the line, at Hay wards, the company has purchased a large tract of land at the mouth of one of the mountain canons, and has fitted it up as a park. A large club house has been located, and seats and tables have been placed in and about the park, beneath the shade trees, which can be used by picnic parties and visitors. There is also a park, with race track and large pavilion, on the branch line near South Lorenzo. This park is fenced in, and an admission fee is charged when the races are on. The lines are enjoying a very liberal patronage, much better than was expected when the system was projected, and the company is to be congratulated on the success of the enterprise.